In working with students individually or in groups, I find that sharing our own stories can be a very effective elicitation technique. I'm a social interactionist at heart, and it's just pragmatically appropriate. Tell a story about yourself and you seem like a real person to the child. This interaction then becomes a context for all kinds of targets: listening skills, visualization for comprehension, use of comments and questions, and the students' own narrative language. This was described as the "Conversational Map" by McCabe and Rollins (1994): "In spontaneous interactions you have to tell a story to get a story. Almost everyone has experienced awkward silences in social situations. No one can think of a thing to say. However, the minute one person launches into a tale about locking keys in his or her car or leaving lights on in a parking lot, virtually all others in the group share a similar incident that happened to them. The exact content of a story prompt is not important per se. What is important is that children are asked to talk about experiences that mean something to them. In general, children are likely to tell their best stories about being hurt or scared. These are experiences that almost all children have had but are significant enough to any particular child to be worth talking about." One tech twist I have on this technique is that I like to present a photo if possible. Photos provide visual support and extend students' understanding of the situation you are describing. The photo you use may also support their commenting or questioning about relevant parts of your story, or constructing inferences based on the way you present the story. They say "the best camera is the one you have with you," and it's true that this is one good use of our smartphones. Keep in mind that small mundane stories that we experience (a spill or broken thing, whatever) can also be good opportunities to photograph and use in therapy. 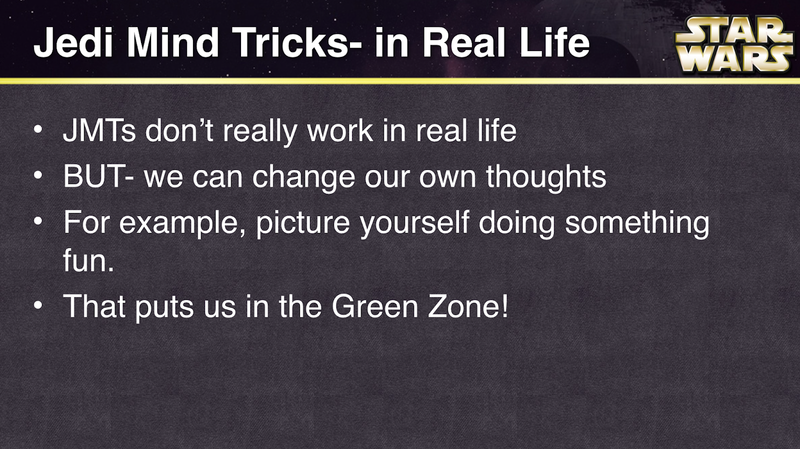 Telling stories need not be completely free-form, but can be tied into specific strategies. I try to keep mine short enough to allow for conversational appropriateness and foster use of comments and questions (see Mindwing Concepts' 6 Second Story conversational scaffold). 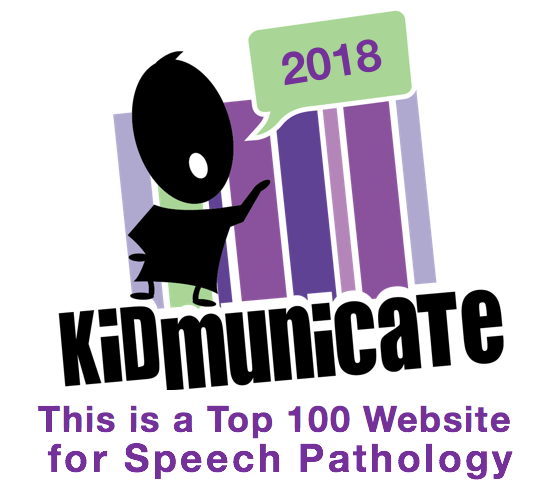 We can also progress from explicitly visual techniques like sketching to using Visualizing and Verbalizing®'s structure words to promote visualization, comprehension and responses. I bought a new car this summer, but left it at home when I went for a week down the Cape. I heard from my neighbor that a car parked right near it somehow went on fire! We don't know how, but everyone was OK. I was worried about the car but glad it didn't get damaged. I went to see the Taylor Swift concert at the end of July at Gillette Stadium. They gave us all wristbands and I wasn't sure why. It turned out they lit up all around the stadium in synch with the music to make patterns. It was a cool surprise! We went to Scarborough Beach in Maine in August. It turns out a foreign ship had docked nearby and brought a new seaweed with it, which was out of control. It stunk and made the water really gross. We found some areas on the beach to swim that didn't have the seaweed. I went for a hike on the Welch and Dickey Loop in New Hampshire. It was beautiful but harder than expected. I'm afraid of open high spaces and it had a lot of those. This steep ledge was wet from rain the day before and I slipped and almost slid backwards down it. Thankfully I grabbed onto a tree and was safe! Have fun telling your stories! In my last post, I discussed how some Star Wars conversation led a group of mine to some engaging self-regulation activities incorporating movement. I always like extending themes, and observe that both watching short videos and, for some reason, watching me type into a presentation slide both get kids talking! I found a Star Wars template easily and we used this "blank space" to map out some social narratives related to play, thinking, self-talk and regulation, and social cognition after reviewing some short videos. In this video Obi-Wan uses a Jedi Mind Trick. It was a great context to analyze the narrative, in our case with Story Grammar Marker®, but also could be approached with other strategies. The narrative could also be flipped and analyzed from Luke's perspective, who at this point is mystified by Obi Wan's powers. We also role-played JMTs just for fun and playfulness. -Rey ineffectively using her skills, then succeeding after regulating herself better. -Yoda's statement of "There is no try" prompted a great conversation and narratives in my group about times they had effectively tried, and the role of failure in learning. -In a fun followup contextual activity, my students worked in small groups to make a "same but different" version of this activity using the free Scratch Jr. app, instead of a car in the city driving a Star Wars vehicle across space or the desert. -The book Darth Vader and Son (Jeffrey Brown) is filled with comics building mini-narratives incorporating perspective taking and inference. May the Force be with YOU this school year! A theme of my agendas for sessions last year included engaging my students more in movement. 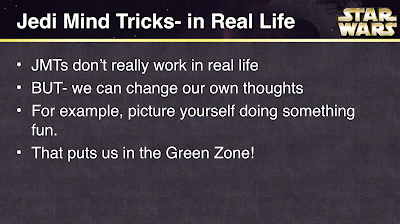 Movement at the beginning of or during sessions promotes self-regulation (it can be a Green Zone of Regulation® "tool") and following a Group Plan (via Social Thinking®) but also can be a way to practice the language of giving and following directions. Anytime we get our regulation-challenged kids up from a table also gives us a lot of teachable moments. With one group last year I did short movement activities we framed as "Jedi Training" as they were all interested in Star Wars. I noted they liked doing activities like planks in unison or one at a time, providing opportunities to "think with their eyes." Check out Sworkit Kids (free for iOS and Android) which has short "workouts" with exercises shown via video models (also touching on an EBP). It's simple, and you can skip exercises and do what you want within a 5 minute "activity." A lot of these have kids on the floor so you may want to get some mats of some kind. 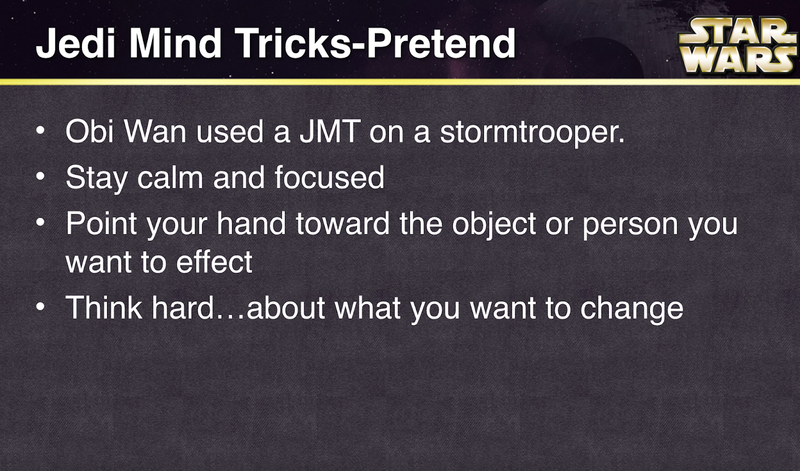 I'm going to try these this year with a few different groups as part of "Jedi" or other themed "training." Still summer...so want some lemonade? They say August is one long Sunday. Here in Massachusetts we still have about a month left until school even starts, so its difficult to see posts from friends across the country who have already started, as well as the ubiquitous "back to school" and "summer's almost over, so..." ads. It pulls you out of it a bit, you know? I've spent my summer working on getting fit, hiking and doing some traveling, so it's been great. But HOT! Here are two ways to play it. 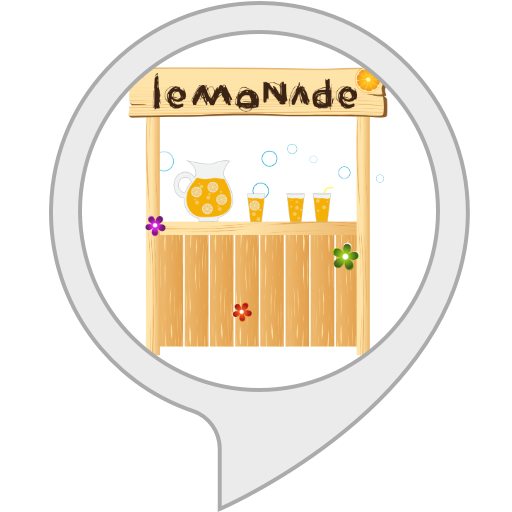 -Toward the end of the school year, I played the Alexa version on Echo Dot (enable the skill by saying "Alexa, launch Lemonade Stand"). This free skill provided a few extra elements that I found helpful: more opportunity for auditory comprehension and listening work, turn taking in speaking, using visual supports, and processing the humor and figurative language offered in this particular skill.